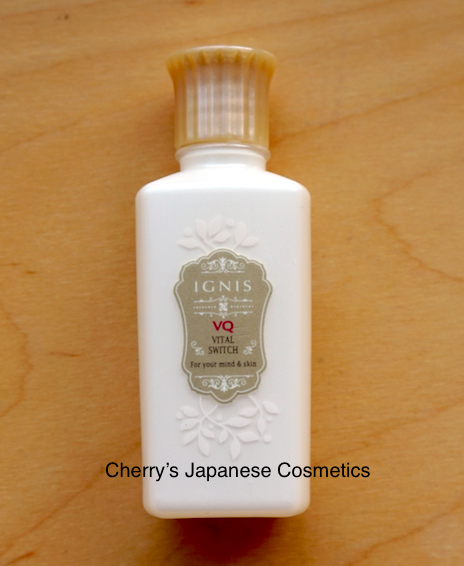 We chose Ignis VQ Brightening Kit as our Japanese Girl’s Beauty Box: April 2015. FINALLY I (Cherry) can review this Ignis VQ Vital Switch! This is a brightening essence. Let me apply on my hand. Oh, it is just a liquid. Usually in here Japan, “essence” things are more likely to serums. We often categorize those product as lotion. Applying this on whole of my face, frankly to say, I found something quite small itchy, gone quickly, it maybe because my skin is sensitive, and still not a perfect condition. On my face, this essence turned to a little bit sticky, and I felt my face is more and more supply. ?? It is for brightening, isn’t it? Because I felt uncomfortable with applying whole of my face, I decided to use my dull part and other freckles points pin-point. Some reviewers are saying when they use this, they often get shining face. Is my skin turning bright? Recently, my face shade is a little bit lighter than my neck 🙁 What happened? To be honest, after my skin condition is getting better, what I use are “brightening” things mainly. Albion Excia AL White line, this Ignis VQ line etc. Pleas check the latest price, and order from here: IGNIS VQ VITAL SWITCH, or wanna purchase by Japanese Yen? Here you are!